Impress your friends with five fast facts about artist Jiha Moon (b. 1973), whose work is on view in NMWA’s collection galleries. Growing up as the middle child in her family, Moon had to fight for attention and concentrated on developing her painting and drawing skills to attract notice. Moon’s parents supported her growing talent and continuing artistic education. Born in Daegu, South Korea, Moon earned her BFA and her first MFA in Seoul. Although she currently lives and works in Atlanta, Moon has worked and studied all over the U.S., including Washington, D.C., where she began her professional career. Jiha Moon, Cascade Crinoline, 2008; Ink and acrylic on hanji paper, 41 x 59 in. ; National Museum of Women in the Arts, Gift of the Georgia State Committee of NMWA; © Jiha Moon. Moon often works on hanji—handmade Korean mulberry paper. She buys a year’s supplywhen she visits Korea. Her use of hanji is significant as one way in which she combines artistic traditions from different cultures. Cascade Crinoline (2008), an ink and acrylic work on hanji paper, references classical Asian painting and reflects her interest in animation and cartoons. Before she explored abstraction at the University of Iowa, Moon’s early works focused on figures. Moon worked primarily with paint until she started incorporating more collage elements after a residency at the Fabric Workshop and Museum from 2009 to 2010, and began working with ceramics in late 2012. Jiha Moon, Leia, 2013; Ceramic and glaze, 13 x 8 x 8 in. ; National Museum of Women in the Arts, Gift of the Georgia Committee of the National Museum of Women in the Arts; © Jiha Moon; Photo courtesy of the artist. When Moon titles her artwork, she considers information that would help an individual examining the image. 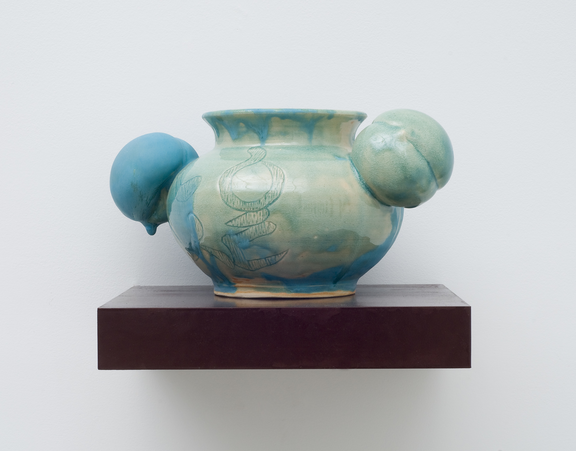 Her titles allow viewers to “get into [her] world.” Moon’s ceramic work in NMWA’s collection, titled Leia (2013), references the character of Princess Leia in Star Wars—and her iconic two-bun hairstyle.